We are in a strange place in our culture. 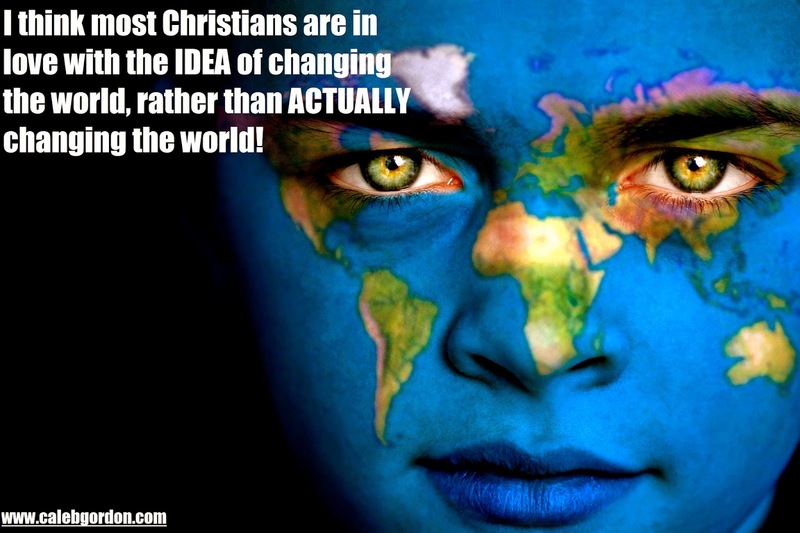 There are alot of churches that say in their mission statement that they really want to help change the world. I know alot of Christians who say they want to change the world…but when opportunities come we shrink away. I can think of at least 4 times last week where I could have shared my faith with someone who I knew was lost, but I did not. I mean I believe with every fiber of my being, that Jesus is the one who could totally transform and revolutionize their lives, why am I silent? Having a desire to change the world, but not really wanting to act on that desire. I really want to change the world. But how can I do that? Most people think that when it comes to changing the world we must go to Africa or some other country in order for that to happen. Actually, it needs to start in my circle of influence. It needs to start with people I know. I need to share the Gospel with people I’m around and let it build and go out from there! Pray for me as I walk in and through this. I don’t just want to love an idea…I want to live that idea out in my everyday life!